I tried not to act like country-come-to-the-city as I walked into the lobby of the Sir Francis Drake Hotel, but my mouth fell open anyway. It was the fanciest place I’d ever seen. A costumed Beefeater had greeted me at the door. Gigantic mirrors were everywhere. Chandeliers. Oil paintings. A huge fireplace. More gilt and marble than I could ever imagine. A grand piano. Sofas and chairs perfectly situated for conversation. 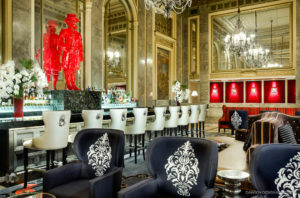 An ornate bar stretching almost the length of the room, with signs reminding guests of complimentary coffee beginning at sun-up and a wine bar at 5:00 every evening. An efficient and soft-spoken desk clerk handed me my key and encouraged me to visit the famed Starlight Lounge on the 21st floor. But after an all-day flight from Nashville with a harried layover in San Diego, all I wanted to do was find my room and collapse. I was in San Francisco to attend a Guideposts magazine workshop and had arranged to share a room with a fellow writer whom I’d never met. I was glad she wasn’t in the room when I got there, because it gave me time to gape some more. Wowie zowie. Carpet so plush that I couldn’t wait to take off my shoes and walk through it barefooted. Fancy beds covered with fancy linens, including snow-white down comforters, and lots of pillows. Real wood furniture, with not a trace of particleboard, including a Chinese red chest that hid the mini-fridge. Who would have thought? A liter of bottled water sat beside the TV. Just the ticket, I thought, but as I reached for it I noticed a price tag on the lid. Six dollars, it said. Ditto for the small bag of cashews beside it. I quickly decided I wasn’t all that hungry or thirsty after all. Flash forward two days to Sunday morning, when I became exceedingly glad I hadn’t squandered that money. “My roommate paid for Friday night. I’m paying for Saturday,” I told the desk clerk as I handed her my debit card. Refused? It wasn’t possible. I had plenty of money in my account, including the advance Guideposts had paid me for the workshop. And I didn’t have another credit card. I called the toll-free number on the back of my card but it kept referring me to my local bank, which was (of course) closed on Sunday morning. What was I to do? I didn’t have enough cash to pay the bill. Would the hotel make me wash coffee cups and wine glasses to settle the 238 dollars I owed them? Would they call the cops? I’ve run out of room to answer those questions now. Check back next week to see if I’m writing my columns from the pokey in San Francisco.